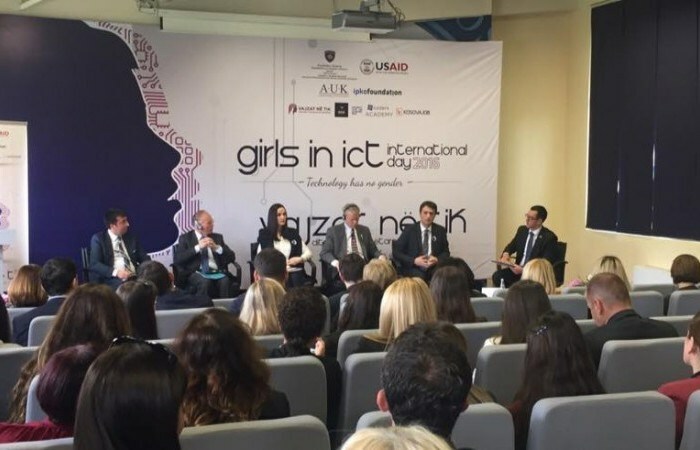 The International Day of Girls in ICT was celebrated on April 28, 2016 in Kosovo, and it was the gathering of the most influential people coming from different backgrounds, who brought diverse opinions on the current status of women in the technology department. This event in Kosovo brought together more than 200 participants at A.U.K Campus and aimed to inspire young girls and women to see technology in a whole new dimension! IPKO Foundation together with A.U.K – Training and Development Institute, Ministry of Economic Development, USAID Kosovo, Girls in ICT, Girls Coding Kosova, and many more partners and friends organized many activities during the day with dedication and effort. This event was a rare opportunity for girls and young women living in our country to get an insight into the ICT sector, consider ICT careers, meet women role models, and get hands-on experience in technology through practical workshops. The day was fully packed with multiple activities through which the participants had the chance to get involved and be active. The conference was opened by Ms. Gjyljeta Mushkolaj – A.U.K board member, and from the Minister of Economic Development, Mr. Blerand Stavileci, who welcomed the audience and shared the Ministry’s latest plans related to IT. The first activity on the agenda was the conference where five panel members were invited to talk on the topic of Gender and ICT. The round-table panel was a collective discussion between the Ambassador of the United States to Kosovo, Greg Delawie, Norway’s Ambassador to Kosovo, Jan Braathu, Deputy Minister of Economic Development, Besa Zogaj, Minister of Diaspora, Valon Murati, and Lundrim Aliu from the World Bank, who highlighted the importance of the involvement of women in ICT sector. The next activity brought in front of the audience presentations from successful international and local speakers, who inspired the audience regarding many opportunities available out there for well-prepared and ambitious individuals. Nele Kapretz, from Impact Hub Berlin, Mergim Cahani from Gjirafa.com, and Ferdinand Kjærulff from Coderstrust unveiled their personal stories of success. The last part of the agenda was dedicated for interesting workshops, which gave practical examples on different topics from “Social Media tips” to “How to build an app for smart phones,” from JCoders, Girls Coding Kosova, Prishtina Hackerspace, A.U.K and Girls in ICT. Last but not least, a Job Fair took place, which matched job seekers with local companies and where instant job interviews were held! Kosovo was among 150 countries worldwide that marked the Girls in ICT International Day by organizing different activities.